The star spider is a colorful species found across the southern part of the United States, from California to Florida, as well as in Central America, Jamaica, and Cuba. 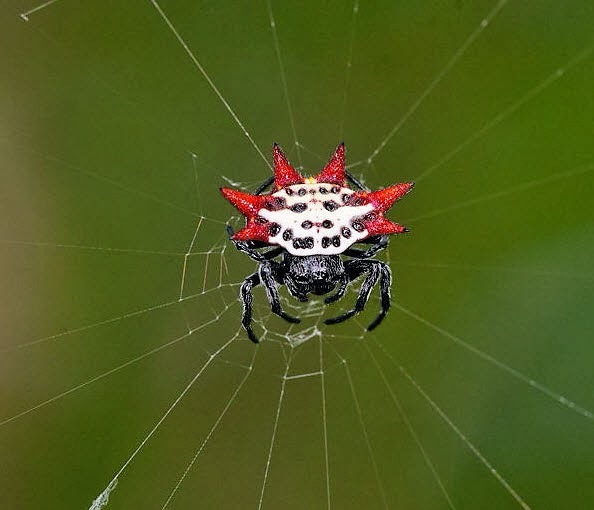 Also known as spiny backed orbweaver, the species is commonly found in trees or around trees in shrubs. The species has been extensively studied in citrus groves in Florida, where they are known as crab spiders. It is probably the best known and popular species from the genus Gasteracantha. Star spiders exhibit sexual dimorphism, meaning that there are obvious differences between the male and female of the species. Females are 5 to 9 mm in length and 10 to 13 mm in width. They are easily identified by their six pointed abdominal projections, frequently referred to as "spines.". Both the colour and shape of these spines shows great geographic variation. Most individuals have white spots on the underside of the abdomen. The colour of the upper abdomen and spines varies and may be red, orange, yellow or white with black spots. Most star spiders have black legs although some individuals have coloured legs. Similarly to most other spiders, males are much smaller, 2 to 3 mm long and a bit shorter in width. Their colour is similar to females, except that their abdomen is gray with white spots. Males don't have abdominal spines, although they do have four or five posterior small humps. Star spiders have a relatively short life. Their lifespan only lasts until reproduction, which usually takes place the spring that follows the winter when they hatched. Females die after producing an egg mass, and males die six days after a complete cycle of sperm induction to the female. Their maximum lifespan in the wild is estimated to be around 1 year. Both male and female hatchlings reach maturity after to 2 to 5 weeks. Star spiders are diurnal, meaning that they are active during the day and sleep during the night. Large webs are constructed only by adult females. Males simply hang from a single thread, usually close to the web of a female. The webs hang at a slight to distinct angle from perpendicular, where the female rests near the bottom, facing down, awaiting to catch her prey. They are solitary animals. Each female has its own individual web with up to three males hanging on silk threads nearby. The species uses visual communication during courtship. Male spiders use a rhythmic pattern when vibrating the web during courtship. Males also move up and down their silk threads to react to other creatures. It is likely that there is a pattern in this up-down movement as well. Like most spider species, star spiders build spider webs,with 10 to 30 raddi, that they use to capture prey. They usually rest in the central disk which is separated from the sticky spirals by an open area 4 to 8 cm wide. There may be as many as 30 loops of the viscid spiral, spaced at 2 to 4 mm intervals. The catching area of the web may have a diameter of 30 to 60 cm. They frequently decorate their webs with conspicuous tufts made of silk, especially on the foundation lines. As of today the function of these tufts remains unknown, although it is hypothesised that they make the web more visible to birds, discouraging them from destroying it by flying through it. Another hypothesis is that the tufts may be used to attract prey or both. However, recent research  seems to favour only the first. hypothesis. Star spider webs can be found 1 to 6 meters above ground. When prey is trapped into the net, the spider moves towards it and then snaps the radii on either side of the insect. Then, the spider snaps more of the web around the area and rushes to bite it. When the prey is smaller her, she just paralyses it and carries it to the central disk. Otherwise, she wraps it up in spider web before carrying it. Sometimes, they will feed right away and come back later to..finish the job. As most spiders, the star spider feeds upon the liquefied insides of her prey.Deliquefied carcasses are discarded from the spiderweb and are easily identified by their mummified state. The species has been recorded to eat whiteflies, flies, moths, beetles and other small fly species that are caught in their nets. Star spiders catch a lot of insects that are considered to be pests in crops and suburban areas and help to control their population. This is why they are considered by some to be beneficial insects. The species has most probably evolved to have a spiky, vividly coloured appearance that makes it look unpalatable to predators. Their very small size also helps them to go unnoticed by most predators. The mating behaviours of star spiders have only been observed in laboratory and controlled environments, where there were only one female and one male to interact with. However, it is believed that their mating behaviour in the wild is similar if not the same. Still, researchers are not sure whether they are monogamous or polygamous. From what we have observed, the male visits the female's web, and uses a 4-tap rhythmical-pattern on the silk of the web to attract the female. After several cautious taps, the female suddenly approaches the male and straps him down with silk before they copulate. The whole process may take 35 minutes up to many hours. The male remains on the female's web and mating may occur repeatedly. The female produces an egg sac which is 20 to 25 mm long by 10 to 15 mm wide, containing 100 to 260 eggs. The egg sacs are deposited on the undersides of leaves adjacent to the female's nest from October through January. The eggs are laid on a white silken sheet. Then they are covered with a loose, tangled mass of fine white or yellowish silk and next several strands of dark green silk are laid by the mother along the longitudinal axis of the egg mass, followed by a net-like canopy of coarse green and yellow threads. The female then dies, leaving the hatchlings to hatch and survive all by themselves. The conservation status of the species has yet to be officially evaluated. However, spiny orb-weavers are abundant throughout their known habitat, hence the species is most probably not endangered in any way. 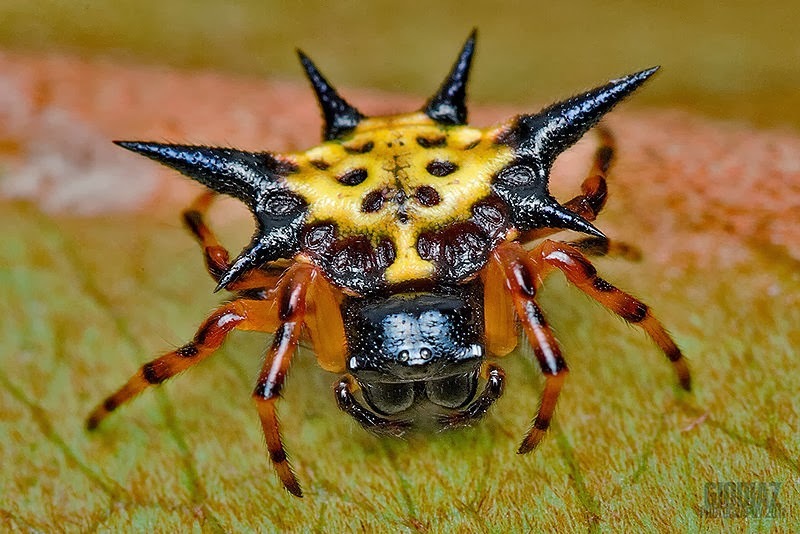 The colourful Gasteracantha Cancriformis is generally harmless to humans and thus they are not considered to be dangerous. 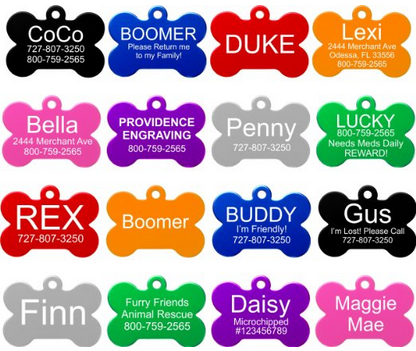 Their bite is described by most to be a mere nuisance. The same applies to their spines, which may puncture human skin when touched in the right angle. - Chamberlin RV, Ivie W. 1944. Spiders of the Georgia region of North America. Bulletin of the University of Utah 35: 1-267. - Levi, H. 1978. The American orb-weaver genera Colphepeira, Microtheno, and Gasteracantha North of Mexico. Bull.Mus.Comp.Zool., 148: 417-442. - Milne, L., M. Milne. 1980. The Audubon Society Field Guide Series. New York: Alfred A. Knopf Inc..
- Muma, M. 1971. 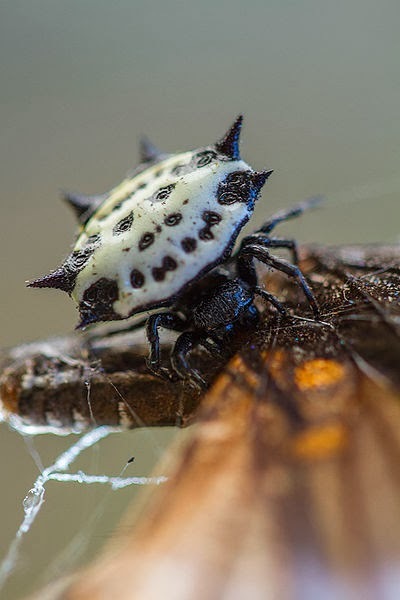 Biological and Behavioral notes on *Gasteracantha cancriformis* (Arachnida: Araneidae). Florida Entemol., 54: 345-351. - Muma, M., K. Stone. 1971. Predation of *Gasteracantha cancriformis* (Arachnida: Araneidae) eggs in Florida citrus groves by *Phalacrotophora epeirae* (Insecta: Phoridae) and *Arachnophaga ferruginea* (Insecta: Eupelmidae). Florida Entemol., 54: 305-310. ..THE CALL OF THE CRAWL! !